But all this marinading comes with a reward – leveling UP. I feel like I have grown so much since my first day on the job and I honestly and defining my plan as I go along. In case you are a new eBay seller, I wanted to write a quick blog post about what I’ve learned this week. I think I am going to do these whenever I have enough content to share. We should all be using that platform or something like it to get rid of the goods in our house that we no longer have a use for. Now, I want to say right off the bat that I am NOT looking to make eBay my CAREER. I have a FULL-TIME JOB as a blogger and an influencer. However, I enjoy being a reseller and it gives me a nice little jolt to get rid of my STUFFFFF. Yes, I like the money. But to be honest with you, I like the hustle more. It’s more about perfecting this game as a new eBay seller. I don’t need to do this to “get rich.” I need to do this to prove to myself that I can make an extra $8,000 a month doing this. Am I crazy? YUPPPEERRSSSS. But that’s the goal. I want to make around $2,000 a week on eBay and not have it take over my life. You think it’s impossible. I say… nothing is impossible. You just need a strategy and creating business strategies is my slow jam. I started a YouTube channel with my partner to showcase some of our learnings and findings as we go along on this ride. Be sure to follow it! We are tracking our mistakes and our victories and our best practices over there. Follow Side Hustler Resellers today on YouTube! How cool is this little app? 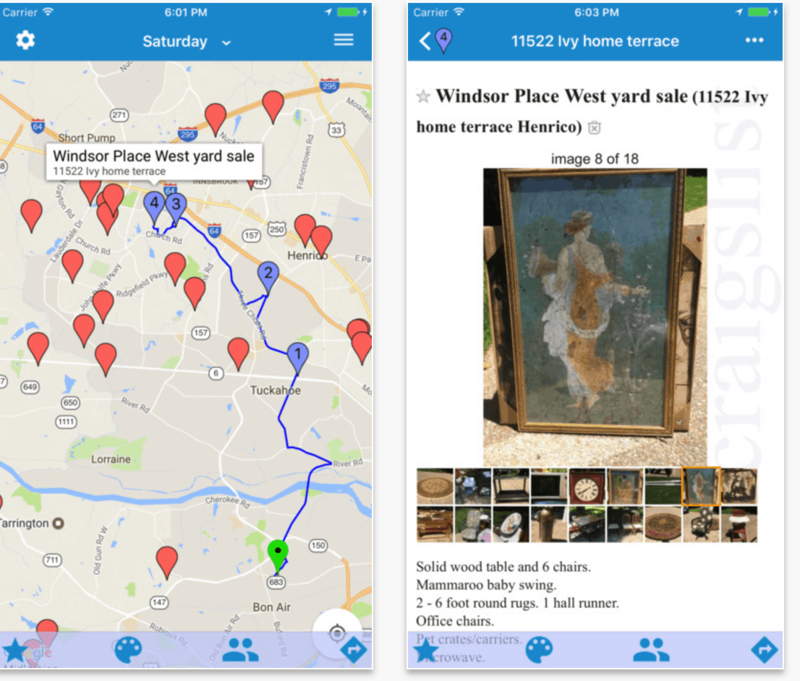 Yard Sale Treasure Map is an app for accessing craigslist garage sales on mobile devices. View your local yard sales in map or list format, view sale details and photos, get directions, and take advantage of advanced organizational and route planning features. You can list 100 items (once you qualify to do so) without having to have a store. A store allows you to run sales and gives you a few other benefits of course. But when you are first starting as a new eBay seller, there is no POINT in spending this extra money. I have found that auctions tend to sell – because I usually start them at around $.99 to get everyone all excited about the purchase. However, if you are good with keeping your inventory around for a while, odds are that you will make more money on a “Fixed Price” listing. You should first list things from your house. Get rid of the things that you are done with and see how you do. If you are ready to take it to the next level and want to start purchasing inventory for the sole purpose of selling, you have to document these expenses. What else should you include? It all matters. Create a system that works for you and start to log everything. Save your receipts too! I’m considering getting a specific credit card just for eBay selling. I think it will make it much easier to document later. Still figuring this one out???? Really settle on a decision here before it’s too late! The last thing you want to do is go 6 months and realize you have no expense to claim. I’ve spent the last few weeks testing out stores in my area. It’s a slow process because I have to drive to and from several towns throughout Long Island. However, this is really helping me out! I am crossing names right off my list. I thought the Christmas Tree Store would be a great place to go. Nope. I thought Savers would be an OK place to check out. Turns out – it’s flipping amazing. I created a notebook and am taking personal notes about each trip in order to save myself time later on. You know when I listen to YouTube videos? When I am in the SHOWER (yes, you read that correctly). When I am cooking dinner. Sometimes, when I am lying in bed waiting for my husband to come in and finish up with work. When I am writing blog posts – like this one. I am actually listening to a video RIGHT NOW as I type. I am multi-tasking. You see, I never just sit and spend hours doing nothing but learning. I am living my life and learning. Usually, I don’t have time to stop and learn. I have to keep pushing forward. So, double up and go – people! Go! Do you have any tips that you’d like to share? Are you a new eBay seller? Would love to hear your experiences! Do you use an app for tracking your mileage?